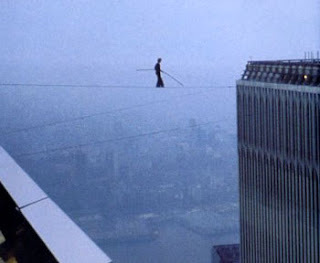 Man on Wire, a beautiful, new documentary, is a film that examines the limitless passion that some men feel. Frenchman Philippe Petit was fascinated with wire walking since he was young. Stringing up a make-shift wire in a field, he practiced relentlessly to master his craft. When he was young, he saw a picture of the World Trade Centers under construction. He realized that they were not going to be far apart, and so began his dream. Practicing on structures like the Notre Dame, Petit spent his life working up to the big payoff. Like the films of Errol Morris, Man on Wire is told using interviews, old footage and reenactments. The funny, dynamic crew talks about how they were stupid enough to even consider stringing up a wire between the two towers. During the interviews, the film cuts between the actual job itself and the leading up to the job. With a great deal of luck, Petit and his grew managed to get to the top of the towers. They spent the night dragging the wire between the two, so come morning, Petit could walk on top of the world. Some of the most breathtaking shots I have ever seen are the pictures of Petit, slowly making his way across the wire. His face one of blankless determination. It is awe inspiring to see a man live out his life goal right before your eyes. Director James Marsh does a very smart thing by letting these images speak for themselves. No zany narration from Petit needed. We know his passion, we feel his desire. I first saw this in high school and I have to admit had not a large impact on 14-year-old me. I failed to recognise it for any of its merit. A re-watch a few weeks ago was like seeing it for the first time. I adored the old footage they used and that final walk really was beautiful. And you are entirely accurate when you say that the images "represents so much more than what they appear". Lovely, concise review Alex! My god, I haven't read this review in years! So glad the film has grown on you - I love everything about this one.